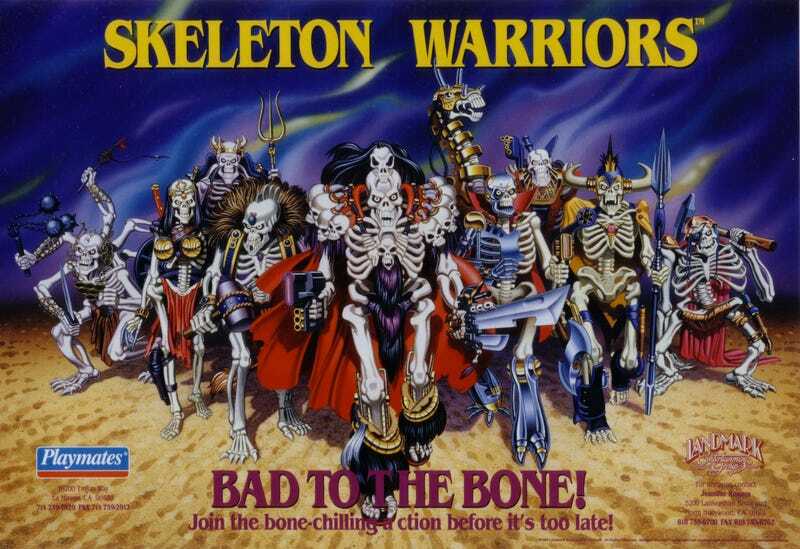 Skeleton Warriors, a short lived cartoon and toyline was possibly the most amazing thing ever and deserves more recognition. Let’s look at what was without a doubt the greatest product of the human race: a cartoon too epic to live and too metal to die. Let’s set the scene with a bit of the first episode. We start in the endless expanse of space then hear a guitar squeal as we see an explosion and a giant golden CG skull with horned helmet flies at the screen. This is merely the introduction of the narrator who provides an Outer Limits style remark before our story proper. Considering this was just the start of the show where could we go from here? Of course that’s where you go. In case you were worried this show didn’t know what was awesome and what wasn’t we immediately see a light saber fight between the two male Steele kids, older brother Justin and younger Joshua. These princes are arguing about who will run the city in light of the king...doing something else....I think they say he’s gone on an expedition. (Most epic absentee father excuse ever) And I don’t know if this place is a monarchy or something different, if their home is a city state or a country. What matters is these kids are in charge of this entire place. Joshua takes off on his sky cycle (think: motorcycle that flies because why not?) to his older friend Baron Dark’s place to let off steam. Baron Dark will be our villain. And they go from angry to complete revolutionary coup in one conversation because we were promised skeleton warriors and every second we don’t have them is an inexcusable pain. The plan was to take the Lightstar Crystal, sort of the power of the entire realm, and while Joshua starts to wuss out Baron Dark goes for the crystal and everything starts to go bad. Baron Dark claims whoever owns the crystal rules Luminicity (so it’s a crystal-based monarchy?). Justin and sister Jennifer arrive and in the ensuing chaos the crystal breaks in half. With the crystal’s destruction Luminicity goes from flourishing at flying car levels of technology to Fallout almost immediately. What’s worse is everyone around the crystal now has powers. Baron Dark has the power to turn anyone with darkness in the hearts into a skeleton and we now have a TV show. Prince Justin Steele: he takes the battle name Prince Lightstar because of course he does. He’s the most unexciting character of the show. He’s a good guy and does good stuff. He has that light saber though he’ll never use it again. 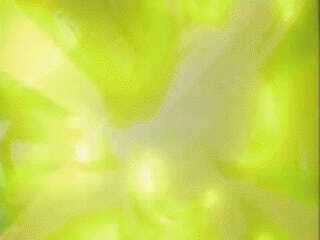 And he shoots beams of light out of his hands. 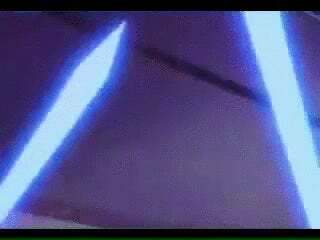 In the video game that would come out you play as Lightstar and everything he hits with his sword is obliterated in a crescendo of explosions. So obviously we have an unreliable narrator for that game, or Justin apologists. Seriously the first boss of that game is a giant bear. Jennifer Steele: becomes Talyn, who can fly and has telescopic vision. Get it, like a bird? Really the most awesome thing about Talyn is she’s voiced by Jennifer Hale. That’s magnitudes of awesome right away but still. Oh and she has a compact wrist-mounted rocket launcher. I guess she really is awesome. Prince Joshua: as a character torn between being good and bad he kind of comes out of the explosion looking like a ghoul or a zombie or the main character from Planescape: Torment. He takes the name Grimskull and forever uses Christian Bale Batman speak. Also he can walk through shadows like an evil teleportation device. As well he has a mind link with Baron Dark though it functions less like a psychic telephone and more like he has a mad skeleton lord in his head. Basically Grimskull is everything that would terrify a kid. He’s a tormented monster who can sneak into your room through the shadows themselves. And he has that damn Batman voice thing. Who cares about Candyman; Grimskull freaks me right out. Also he’s our Byronic hero. Uncle Ursak: taking the name Guardian he’s basically there to dispense insane lines “the house was just for show. This, my underground battle station, is what I’ve spent my life creating”. He’s basically the personification of the turret sequence of a game. Also he’s got a beard. 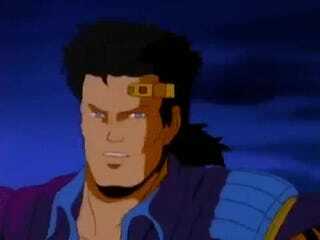 Baron Dark: basically he’s the bad guy from the last third of Army of Darkness. He’s a skeleton who wears shoulder pads made of skulls and ties his hair off with a skull. He can turn anyone who has some bad in them into a skeleton. He has his own repository of evil friends who become his Lieutenants in an evil army of the damned. 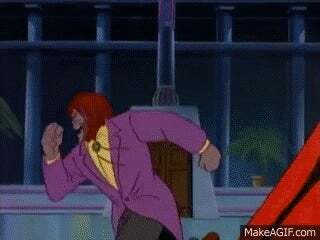 Also he has an absurd amount of fun playing the villain often making light of the more hokey Saturday morning cartoon conventions. Dr. Cyborn: before Baron Dark transformed him he was a half-man half-cyborg mad scientist affront to all that is good; after he is a half-skeleton half-cyborg mad scientist affront to all that is good. Aracula: a six-armed guy who is turned into a six-armed skeleton. Also I have a suspicion he might be a Dracula. Dagger: a one eyed dwarf who still wears an eye patch after becoming a skeleton. Shriek: the evil woman. She’s played as the straight man of the group since all the other henchmen are weird, Dr. Cyborn is a bit of a nerd, Dagger is a dummy, Aracula is anthropomorphized nightmare. She has a thing for Prince Justin. The show is insane but it’s actually really good. Skulls are everywhere, as well as shoulder pads, ray guns, sky cycles. The Baron’s gun has a skull on it, his missiles have a skull on them, his sky cycle has bones all over it. But this isn’t just “evil guy loves skeletons” the heroes have giant skulls on their clothes with piercing spikes for eyes and long fangs. If it wasn’t for the skeleton army it would be kind of hard to judge who the good guys were just from looks. And the sky cycles. Immediately they set up our crazy world that was beloved from this era: a realm with no clearly defined sense of government or era but futuristic technology and knightly codes of chivalry still existing. Baron Dark has been using contention amongst the peasantry to foment distrust of Grimskull. Honestly he doesn’t look like a good guy, but none of them really do. The Baron intends to use a kidnapping to lure Grimskull then turn him to the dark side. He places the bait inside a cage over a giant hole that contains Moo Doo the Conqueror Worm. I’m not sure of spelling but the important part is CONQUEROR WORM! Because of his psychic link Grimskull sees the people being held as bait and must go to there aid. 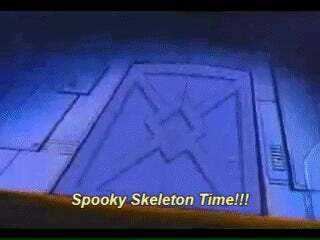 When he arrives Shriek reminds him that they are invincible skeletons and can’t be defeated and that a monster is coming. Grimskull blasts Baron anyways and his bones fly everywhere. Shriek runs at him with a katana of all things. She also is exploded. “Chew on this, fleshy” Dr. Cyborn intones as he throws some rocks at Grimskull. At this point it’s worth noting that for a former scientist, at least doctor of something, he has such a lame fighting style. Grimskull blasts the rocks with his lasers “no thanks.” Classic Grimskull line. However the giant rock lands on Dr. Cyborn crushing him. The conqueror worm arrives and it’s rad, giant teeth dripping with green slime. It’s suitably epic. Grimskull uses his shadow walking ability and the trapped peasants say he must of abandoned them. No, he’s actually warped to their cage. He blasts a hole for them to exit, and for some reason the cage is no longer over the worm but off to the side where they can safely run away. “But your blasts couldn’t even penetrate its skin” the groveling peasant says. “This just became an inside job.” Now that is a Grimskull line. He jumps into the mouth of the conqueror worm and starts blasting away in it’s stomach. Eventually it dies and falls on Baron Dark who had apparently gotten his bones back together in the ensuing chaos. Grimskull throws Dr. Cyborn and Shriek down the endless hole the conqueror worm lived in. Grimskull and the hostages arrive on their sky cycles as some sort of impeachment meeting was taking place. “Sorry I’m late I had to worm my way out of a bad situation.” Grimskull for the win. As you can see it was clearly the greatest event in TV history. The show was cancelled after 13 episodes. With copious amounts of skulls and shoulder pads and mullets Skeleton Warriors left it’s mark on the American spirit. Mostly by giving kids horrifying nightmares about skeletons turning their family to monsters and a guy with no face and a giant skull with spikes for eyes on his shirt violating the sanctity of their room at night. You can’t protect yourself from the shadows kids. Really it was a good story about evil and good set in a post-apocalyptic world. Themes were one thing but it also had fun, campy performances from the actors in what was obviously a great story to tell. It’s use of story ideas like Baron Dark getting into Grimskulls mind or Uncle Ursak having psychic visions of the future thanks to a science experiment he was involved in were so far beyond what most kids shows were doing at the time. There are often times, when viewing these old shows cancelled after one season, that these old shows look like they didn’t have the substance to continue for TMNT levels of time. That couldn’t be further from the truth here as the show had a good idea of what sort of story it was telling maintaining an ethic along the way about good and evil similar to X-Men’s mutant message. 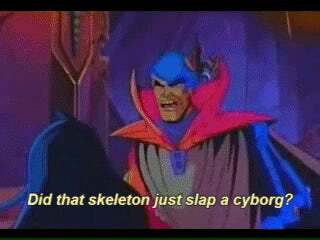 Only Skeleton Warriors wasn’t really preachy, it cared more about throwing sci-fi and horror elements together and seeing what sort of circus resulted. Honestly I like it because as goofy as it is it hints at what I always wanted to see, a middle ground of animation for adolescents from western animators to match what anime was able to do. Western animation isn’t inherently inferior, but the fact that such an awesome premise would perish after so short a run tells you a lot about how gunshy programming departments are. For a moment CBS Saturday morning cartoons were koo-koo bananas. However they skipped the villain toys first, and when moms were faced with picking from an army of the damned or Power Rangers they went with Power Rangers. Probably not the worst thing that could happen, Power Rangers became a gateway to a lot of interesting stuff for young people at the time. Season 2 was cancelled but judging by the toys it was going to have skeleton samurai and skeletal dragons. With shoulder mounted laser cannons. So yeah our loss.